As the drowning death toll continues to climb at tourist spots like Kauai, a woman who lost her fiancé at sea is now advocating that the beautiful but deadly location be barricaded off. 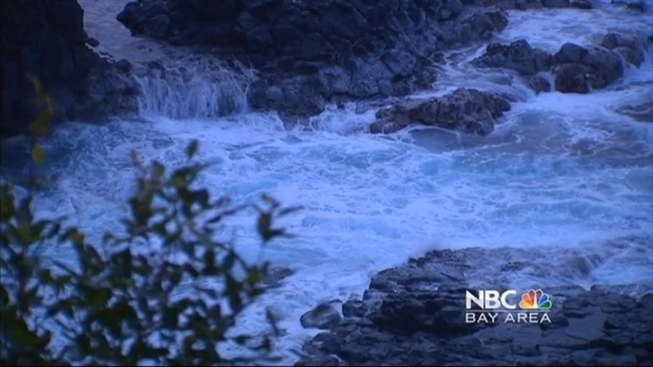 “It’s so beautiful and inviting people don’t realize how dangerous it can be -- once you are in the water, it’s a death trap,” said San Francisco resident Jen Kwong. The NBC Bay Area Investigative Unit traveled to Kauai to figure out why one of the least inhabited islands sees the most drownings-per-capita in Hawaii. In her first television interview, Kwong told the Investigative Unit that she was saddened to learn more tourists had died on the island of Kauai. Kwong watched her fiancé Adam Griffiths and his friend, Brian Baker, get swept out to sea by a rogue wave last January. They hiked into a remote lava pool near Secret’s Beach and had no intention of swimming that day. Griffiths and Baker are two of 16 people who have drowned in Kauai waters this year. Overall, Hawaii has had a 40 percent increase in Bay Area travelers in the last five years. “My heart just sank,” recalled Kwong after hearing that the number of non-resident drownings has surged. In total, there have been 11 this year. The majority of the sixteen tragedies involved visitors from California following by Colorado and New York State. “People are interested in adventures and finding more beautiful places and that’s part of what happened to us,” Kwong said. Many of the accidents have taken place are off the beaten path. Today Kwong can’t even look at the ocean because it brings back too many painful memories. Monty Downs, an emergency room doctor at Wilcox Hospital in Kauai and the President of the Kauai Lifeguard Association, told the Investigative Unit that the majority have also occurred at non-lifeguarded beaches and along lava rock shelves. Downs warns the lava pools will be even more dangerous as the winter months bring in larger and powerful waves. “They are almost like hand-grenade explosions if you go to the rock ledge and see what really happens when the winter swells come in. The waves explode 100 feet in the air,” Downs told the Investigative Unit. Downs said local leaders have worked hard to try and prevent the tragedies but more needs to be done. He has called for an emergency summit, in which government leaders and first responders can come together to come up with additional solutions. County spokesperson Beth Tokioka told the Investigative Unit officials are open to holding an emergency summit but not just yet. Tokioka believes first there needs to be closer analysis of the drownings to see if there have been any commonalities. In an email in part, saying: “we really need to strategically look at each incident this year to determine if or how it could have been prevented, if there are any commonalities or patterns, etc. Just putting more lifeguards on beaches may not make a difference,” wrote Tokioka. It’s unclear if there has been discussion about barricading off some of the popular off the beaten path spots. In the meantime, Jen Kwong hopes that other tourist will learn from her tragedy and be extra cautious this holiday travel season. Kwong had planned to marry Adam Griffiths last month. “Nature is beautiful, incredible, and amazing but also so powerful. We can appreciate it but appreciate it in a way that you can’t beat it- just let it be,” Kwong said.